Welcome to Waber Tool & Engineering Company, Inc.
Zip-Cut Horizontal Drilling Machines are ideal for drilling large holes in truck frames, I-beams, or any other horizontal holes where portable electric tools have to be used. 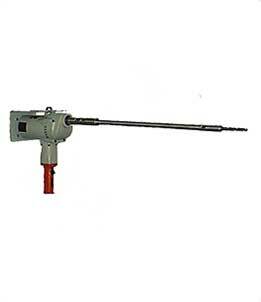 An excellent drilling tool for horizontal drilling needs. 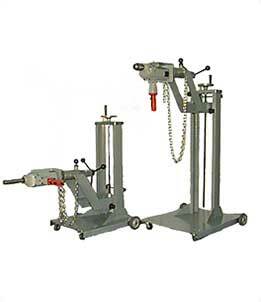 Position frame drill Horizontally, elevate drill to desired height with hand crank. Secure chain around frame or unit to be drilled. Some call it unique – we call it the “Frame Drill”. It answers the need for horizontal drilling and truck frame drilling. Turn the forward feed handle, advancing the drill to the center punch. Start drill motor and advance drill through work by turning forward feed handle. Drill can be indexed to 4 different positions for complete 360° rotation; by means of a plunger stop. This assures your ability to drill close to any obstacle. Heavy steel fabricated base with elevating ball screw. Precision screw for easy horizontal drill feeds. Available with or without drill motor. Standard: Height range of 18″ to 46″. Tall: Height range of 18″to 58″. Additional Height: More than 12″ is available by special order. 854-1: 120v 60hz. RPM 350 Reversing motor with 3/4″ drill chuck. 2404-1: 120v 60hz. RPM 250 Reversing motor with # 3 Morse Taper. No Motor: Horizontal Drills are also available without a drill motor. 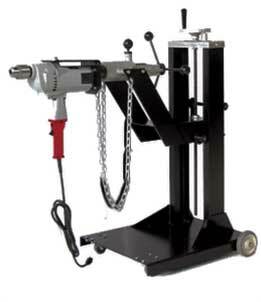 The 28″ horizontal drill extension is designed to allow you to drill over and around mounted tires. The drill extension comes with a #2 morse taper end.